OEM pressure sensor modules are calibrated and temperature compensated pressure sensors on a PCB, which are ready for packaging. They feature versatile electrical connection options and can be integrated into complex assemblies or mounted in a package. Analog Microelectronics produces universal pressure sensor modules for differential pressure, absolute pressure, relative pressure or vacuum with an industrial voltage output (0 … 5 V or 0 … 10 V) as well as a 4 … 20 mA current-loop output in various pressure ranges from 0 … 5 mbar up to 0 … 1 bar. The OEM sensor modules allow precise pressure measurements in a wide temperature range from -25 … 85 °C and are especially suitable for industrial applications. Custom specific pressure ranges and further modifications are available on request. 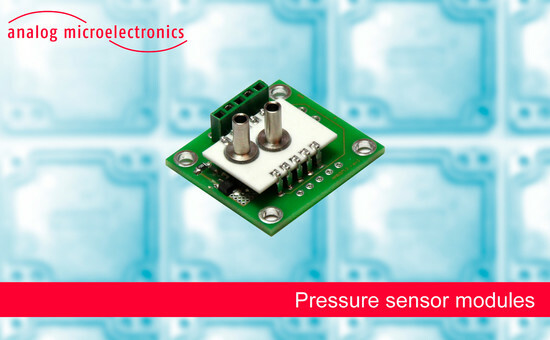 Board-mount pressure sensors are designed for assembly on PCBs and can be used for pressure measurement with non-corrosive gases and fluids. Analog Microelectronics provides a comprehensive range of high quality board-level pressure sensors for precise measurement of differential pressure, absolute pressure, relative pressure or vacuum. We produce pressure sensor series with analog output, digital I2C output or switching output in different packages for various applications (e.g. medical instrumentation, HVAC or industrial applications). The sensors are available in pressure ranges from 0 … 5 mbar up to 0 … 10 bar. Furthermore we offer custom specific calibrations and modifications of our board-mount pressure sensors. Pressure transmitters are completely packaged pressure sensors converting a pressure signal into a standardized, electrical output signal. They can be integrated into machines or used under harsh environmental conditions in outdoor applications. Analog Microelectronics provides miniaturized pressure transmitters for precise measurements of differential pressure, absolute pressure, relative pressure or vacuum. Our pressure transmitter series feature a rugged plastic or metal package (protection class IP 67) and an industrial voltage output (0 … 5 V or 0 … 10 V) or a 4 ... 20 mA current-loop output. The transmitters are available in pressure ranges from 0 … 5 mbar up to 0 … 10 bar. On request we offer custom specific calibration of our pressure transmitters. 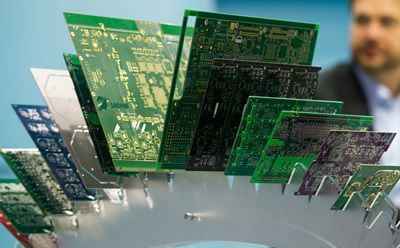 Analog Microelectronics develops and produces integrated circuits (ICs) for sensing and signal-conditioning applications. The rugged, analog ICs are especially suitable for industrial applications. Our IC product range comprises amplifiers for the evaluation of Wheatstone bridges or single ended input voltages, V/I-converters for current-loop or three-wire applications and capacitance-to-voltage converters for the evaluation of capacitive structures and sensors (single or differential capacitances). Exhibitors of electronica present their highlights and novelties! Let us give you some inspiration! 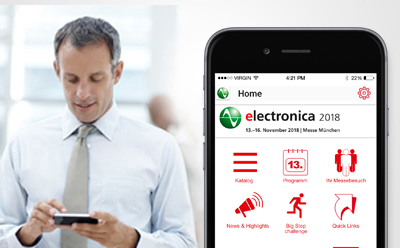 Your mobile trade fair guide - download the free electronica app to your tablet or smartphone!